This captivating facade of stone and stucco commands immediate curb appeal, while the two-story arched portico creates a dramatic entryway into this impressive home plan. 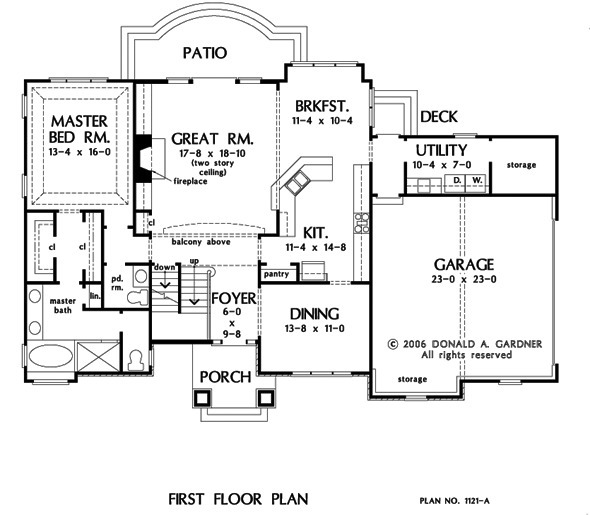 Inside this house plan, the two-story foyer spills into a spacious great room that overlooks the rear patio. Flowing into the breakfast room, the great room is divided solely by the kitchen island and contributes to the open layout of the plan. The master bedroom features a tray ceiling for added detail, while a walk-in closet and dual sinks grant convenience. The upstairs of this house plan features secondary bedrooms and a balcony that overlooks the two-story great room. 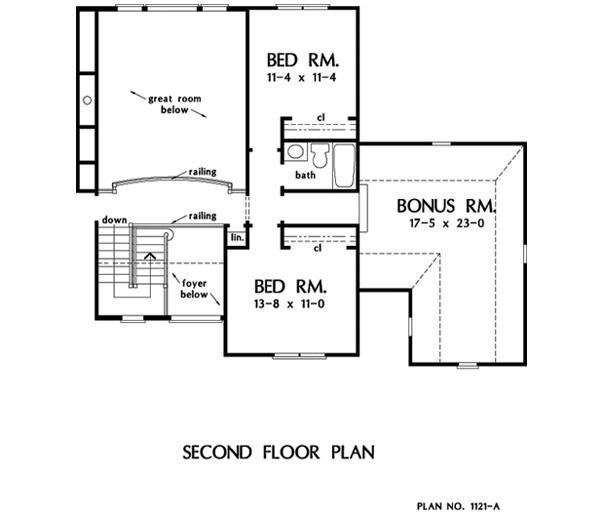 The nearby bonus room is large enough for an entertainment room or child's playroom. 1st Floor: 1770 Sq. Ft. Bonus Room: 407 Sq. 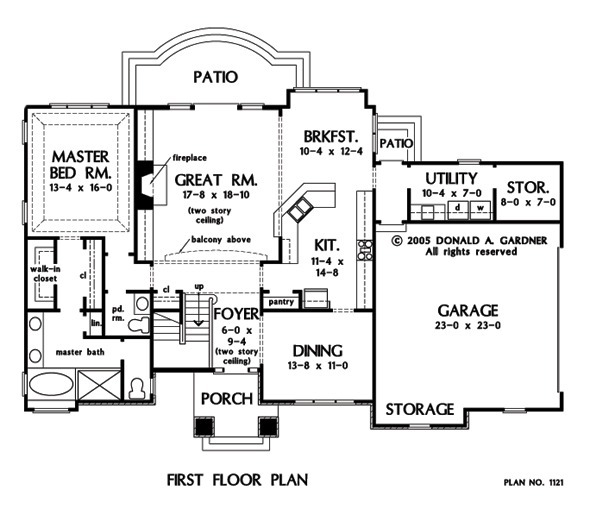 Ft.
House Dimensions: 67' 0" x 43' 0"
Great Room: 17' 8" x 18' 10"
Storage (1st Fl.) 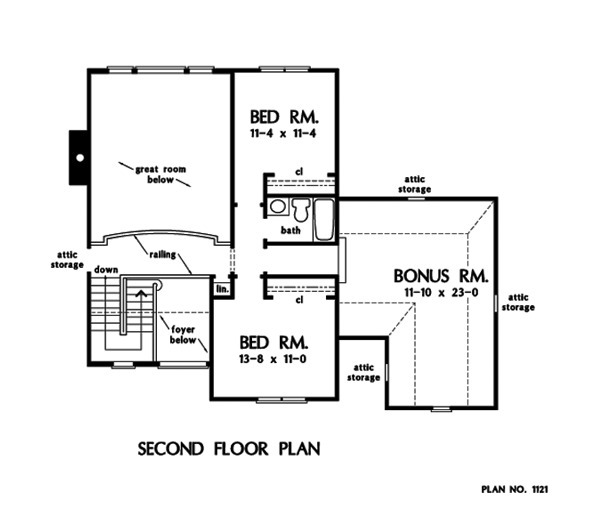 : 8' 0" x 7' 0" x 9' 0"
Utility Room : 10' 4" x 7' 0" x 9' 0"
Bedroom #2 : 13' 8" x 11' 0" x 8' 0"
Bedroom #3 : 11' 4" x 11' 4" x 8' 0"
Bonus Room : 11' 10" x 23' 0" x 9' 0"
Breakfast Room : 11' 4" x 9' 4" x 9' 0"
Dining Room : 13' 8" x 11' 0" x 9' 0"
Foyer : 6' 0" x 9' 4" x 18' 0"
Garage Storage : 11' 0" x 2' 0" x 0' 0"
Great Room : 17' 8" x 18' 10" x 18' 0"
Patio - Rear : 20' 0" x 5' 0" x 0' 0"
Patio - Side : 4' 0" x 4' 0" x 0' 0"
Porch - Front : 8' 3" x 8' 1" x 14' 9"